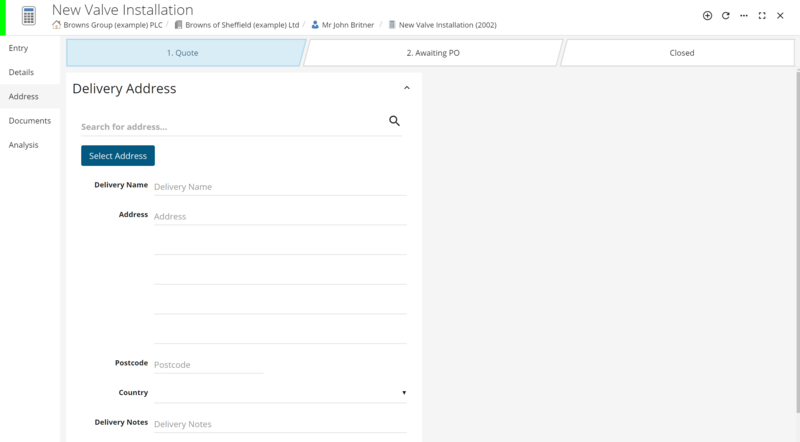 Creating a Quote record is very straight forward in the CRM. When you are on a Division or a Contact just select the + icon and pick Quote from the drop-down options. After selecting the Quote option from the drop-down, a new Quote window will open where you can start to log information about this Quote. The description should outline what the sales opportunity entails, therefore it is important that you give it a relevant description. From the creation window you can also set the currency, choose a Quote template to base the Quote on, choose the salesperson who will be managing this opportunity & finally the Pipeline. If you have not specified a bespoke Pipeline then this will use the default Quote Pipeline which includes a series of statuses; 1. Quote, 2. Awaiting PO, 3. Ordered or Cancelled. Once you are happy with the information you have entered, just press Create at the bottom and you will be taken to your new Quote record. Upon creation, a Lead record would have also been created with the same description & unique ID. 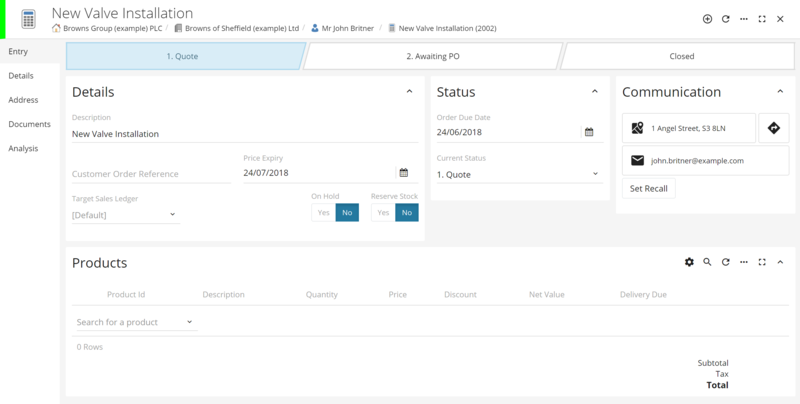 Customer Order Reference: In addition to the unique Quote reference which is created automatically when the record is first made, shown below, you can also add an additional reference if required by the customer. Source & Source Activity: As with a Lead these are very useful options where you can record where the Quote originally came from. Options could include an Exhibition, a Mail Shot, generated from a Salesperson visit or by visiting your Website. If you have used a Campaign from within the CRM, you can use the Source option to link Leads to Campaign Activities. This allows you to record potential income based on Activities you have performed, i.e. how many Leads and subsequent Quotes were generated after holding an Exhibition. Sales Person: A user of the CRM can be selected from this drop down to be associated with the Record. This helps when searching and reporting to determine which user has contributed to the creation of the quote, essentially, the user who we want to take credit for the hard work. Price Expiry: Once this is set, a pop up will appear warning if the date is in the past, this will happen when a Quote document is created or an order attempts to be confirmed. This is so that the user can confirm that the price is still current. Status: This will show which status the Quote is currently in. There are several different statuses available to be displayed such as ‘Quote’, 'Awaiting PO' etc. Depending on the settings within the CRM, it will either default to the address for the Sales Ledger, the Division or the Contact record. By clicking on ‘Select Address’ it will allow you to search for a different address or add a unique one. If you enter a postcode or area into the ‘Search for address…’ section, it will return a list of available addresses and if one is selected then it will automatically populate the address fields. For more information about creating a Quote within the CRM please see our video below.